Its name alone tells you that the blobfish isn’t going to win any beauty contests. In fact, a few years ago it won an ugly contest -- it was declared the ugliest animal on the planet. That’s a bit misleading, though: No one is going to look their best if they’ve just been hauled up from far below the ocean waves. The blobfish is found off the coast of Australia and the island of Tasmania, at depths of about 2,000 to 4,000 feet. In this natural habitat, it looks a bit like a cartoon character. It has a wide, round head, and a tapered body that can reach about a foot in length. 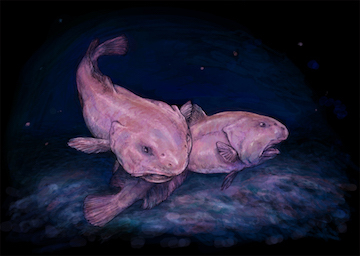 The blobfish doesn’t have a swim bladder to allow it to control its depth. Instead, it floats just above the ocean floor, waiting for shellfish and other tasty tidbits to come along. It has soft bones, and its flesh, which is less dense than water, is jelly-like. This loose, rubbery body allows the blobfish to withstand the great pressure of its deep abode, which can be a hundred times the pressure at the surface or greater. Its gelatinous body and odd shape make the blobfish a bit strange looking, but not especially ugly. But some blobfish have been caught in fishing nets and brought to the surface. The lower pressure makes their bodies look puffy, swollen, and -- well, blobby. Pictures of such blobfish were judged in the contest, which was held to raise awareness of some of nature’s less-cuddly creatures. So, pulled from its home in the ocean depths, the blobfish was a winner -- the ugliest animal on Earth.